Here is a lymph node involved by lymphoma, a malignant process characterized by the proliferation of neoplastic lymphoid cells. The capsule of the node has been invaded and the lymphomatous cells extend into the surrounding adipose tissue. Note that the follicles are numerous and irregularly sized. 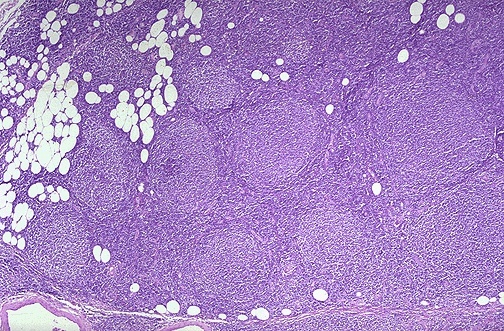 This is a follicular center cell malignant lymphoma (also described as small cleaved cell type, follicular, or as malignant lymphoma, poorly differentiated lymphocytic type, nodular).